Pentaflex executive vice president and owner Ross McGregor (left) fully supports president and CEO Dave Arndt’s mission to drive the company forward, including investing mightily in new capital improvement. Example: a new 700-ton Aida servo press shown here, which stamps truck-brake dust shields at speeds to 28 strokes/min. ; press speed topped out at 20 strokes/min. using a conventional mechanical press. 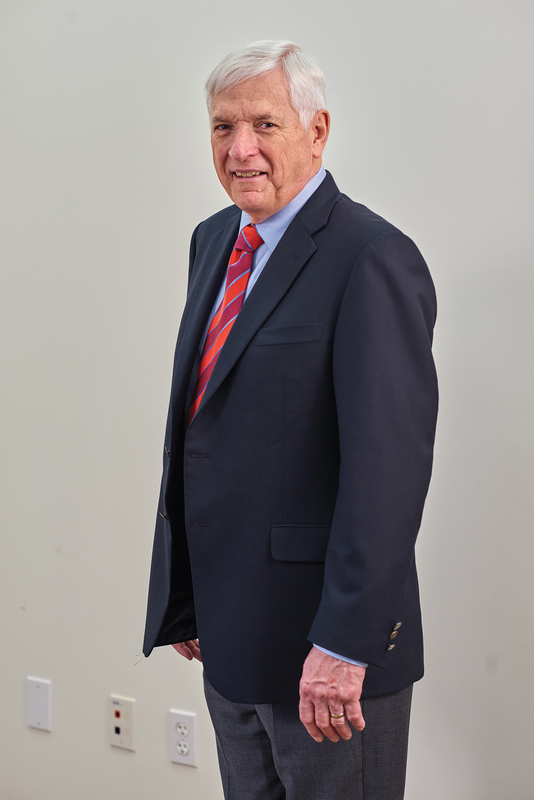 Arndt also says that he spends a lot of time thinking about the future—of his metalforming company and, now, the Precision Metalforming Association (PMA), since he becomes its chairman for the coming fiscal year. “2017 marks a new era for PMA and the manufacturing industry overall,” Arndt shares. For the industry, he refers to the new and vastly different administration taking over in Washington, D.C. For PMA, he refers to a new president taking over for the retiring Bill Gaskin, who has served as PMA president since August 2000 (he started with PMA on March 1, 1977). Operations director Kirk Smith (center), quality director Jim Zerkle (left) and technician Tony Rose discuss the firm’s vision-inspection system (designed and built by MJ Engineering, Gahanna, OH). On the wall are several of the 85 different truck-brake dust shields the company stamps. Pentaflex HR director Melissa McCrillis (an active participant in the PMA HR listserve online-discussion group) discusses training opportunities with CNC machine operator Zachary Bebout, a recent recruit from a local high-school Career Technical Center (CTC). Each year Pentaflex hosts dozens of CTC students and instructors as part of its Manufacturing Day activities. Bebout operates a Haas VF-2YT vertical machining center used to drill, bore and chamfer stamped brake spiders. Pentaflex won a 2016 PMA Award of Excellence for converting the brake spider from a cast part to a stamped and machined part. 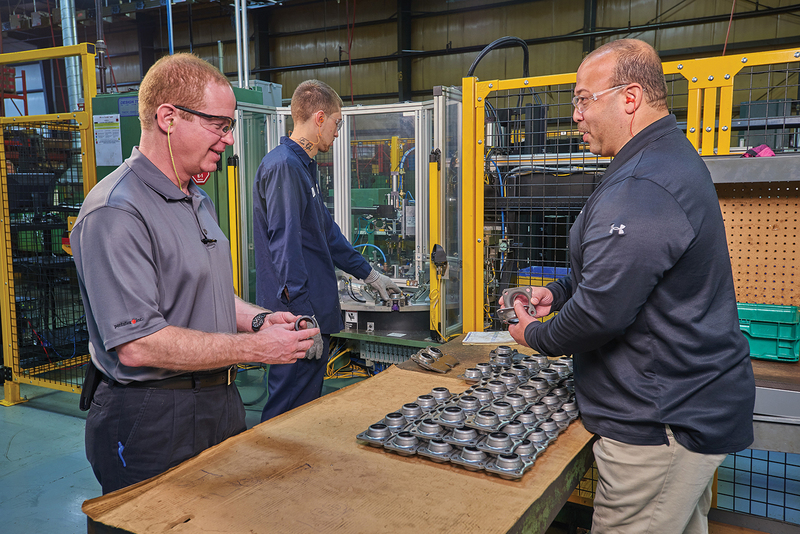 Finding, training and retaining the next generation of the manufacturing workforce is a pain point for most if not all metalformers, and Pentaflex is no exception. Arndt admits as much, noting its recent effort to add 40 employees to its ranks in the midst of a 2015 expansion. Defining those growing pains, he notes that he had to hire 160 temporary workers to develop 40 that met the company’s expectations. To help metalformers with on-boarding efforts, PMA launched in 2016 the OnBoardingME (Onboarding Metalforming Employees) DVD video-training program. Pentaflex is among some 50 or so companies that have purchased the OnBoardingME DVD. 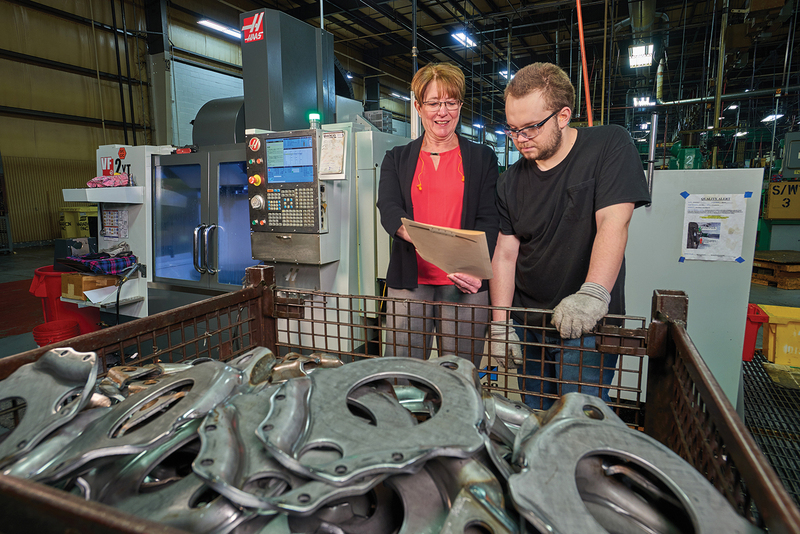 Designed for use by HR managers and others as a first-day on-the-job orientation resource, the program prescribes a set of coordinated policies, practices and procedures to help new metalforming-company employees adjust to their new jobs. Included are suggestions for HR-team members related to new-hire orientation and job shadowing, and, of course, chapters dedicated to personal safety, safe work practices and emergency response. Safety also has been a focus for Pentaflex, a 2014 winner of PMA’s Award of Excellence for safety, but which saw its lost-day total increase following its hiring spurt. Its renewed efforts to raise safety awareness in 2016 led to a dramatic improvement in its safety performance. Safety, and other topics critical to PMA’s future under Arndt and other chairmen to come, takes a front seat as PMA looks to invest in e-learning technology. The association has identified several training programs and additional educational material that need updating, and seeks to do so in a manner that allows metalformers to access them via an e-learning system. The list of companies where Dave Arndt has worked couldn’t be much more impressive—it includes General Motors, Ford, Creative Industries, Oxford Automotive, Faurecia and AG Simpson. And, he’s managed small to mid-sized metalforming companies—Eclipse Manufacturing and, currently, Pentaflex. He’s worked on the production floor and has held middle- and top-management jobs, all of which have fueled his passion for manufacturing and stoked his competitive fire. A graduate of General Motors Institute, Arndt went to work on the production floor of Chevy Detroit Gear and Axle, then moved over to Ford Engineering and progressed into middle management (earning a patent along the way related to brake engineering). From there Arndt entered the prototyping world, first at Creative Industries and then with his startup company, Advanced Vehicle Concepts. Career milestones include working on concept vehicles for GM, composite-tooling work for the black-box” B2 bomber, and development of aerodynamic class-8 truck hoods. Over his diverse career, Arndt has cherished the opportunity to learn from some of the automotive industry’s top managers, and held positions including engineering manager, vice president of sales, vice president of engineering, vice president of operations, president and now CEO. Working with larger companies exposed Arndt to manufacturing on a global basis, with hands-on metal-stamping experience in far-away places like Brazil, Thailand and Venezuela. Such a diverse background, he believes, allows him to bring a unique skill set to Pentaflex. “Pentaflex is a family-owned business,” he says, “and they’re dedicated to driving the company forward using innovative management techniques and by investing in technology. We’ve invested $10 million since 2014 to upgrade the plant, including two new automated assembly cells and two new servo presses, and we refurbished a 1600-ton stamping press and built a 26,000-sq.-ft. plant addition. Arndt’s been at the Pentaflex helm since 2012, and since that time the company has won five PMA Awards of Excellence, including awards for safety and product development. 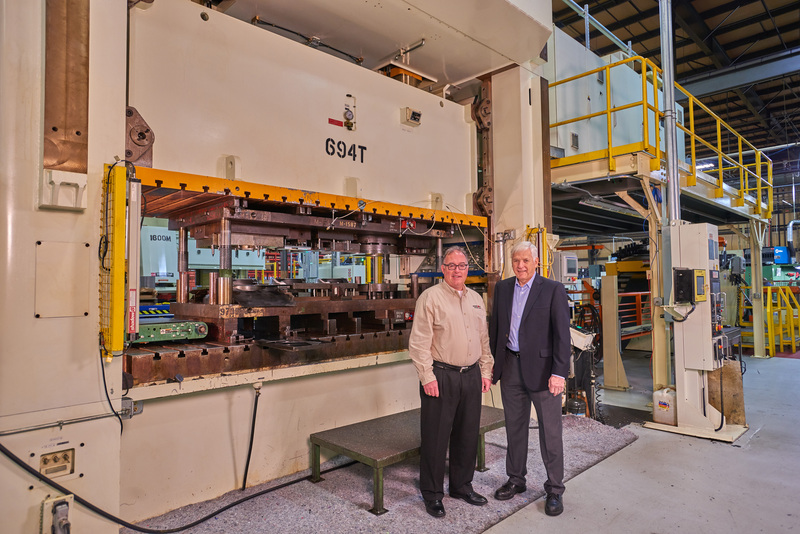 The firm manufactures heavy-gauge deep-drawn parts for the heavy-truck market, and has new initiatives (using its new servo presses) to move into lighter-gauge stamping. And, it’s added new CNC machining centers in the last year or so to develop machining as a core competency. From the student or learner perspective, e-learning provides personalized access to assigned course materials, messaging and notifications, and access to scores and transcripts. Access to content can be accomplished through a variety of devices, including laptops, tablets and cell phones. The association has been addressing that question for the last several years, and most notably it launched in 2016 the MFG NXT initiative, and the Leadership and Mentoring Academy (LMA). MFG NXT is a PMA recruitment and retention initiative centered on supporting millennials and gen-Xers rising through the ranks of the metalforming industry. Launched in mid-2016, its programming includes events that bring together talented young leaders to learn about a variety of topics, including technology- and leadership-based subjects. Meanwhile, PMA’s LMA, born from a commitment made by past-PMA Chairman Bill Smith (president of metalformer Termax Corp., Lake Zurich, IL), and funded in part by a grant from the PMA Educational Foundation, aims to provide structured mentoring to the next generation of metalforming leadership. Veteran industry professionals are volunteering their time and expertise to support this important cause. Arndt helped PMA launch the LMA, by participating as a mentor during the three-month pilot program. He has been mentoring Russell Hurst, sales manager (and previously operations manager) at metalformer Phoenix Specialty Mfg. Co., Bamberg, SC. “Dave has shared his extensive, unique experience with me,” Hurst says, “having worked for multiple companies and in different markets. He’s done startups, he’s done turnarounds, and he has a wealth of experience that I don’t otherwise have access to. Dave’s been there for me, sharing ideas and in many cases cautioning me on what not to do. Lastly, Arndt points out that on September 19-22, 2017, ICOSPA (the International Council of Sheetmetal Presswork Associations) will host its 19th Congress, in Suzhou, China. The event enables PMA companies to interface with metalformers from Europe and Asia to learn about best practices. Attendees will tour Chinese metal-stamping companies, and hear presentations on big data, testing and inspection of stamped parts, and forming-process simulation. “This is a great opportunity for PMA members to visit China and see what’s happening in its metalforming companies,” he says. Arndt has been a strong advocate for building strong ties between manufacturing and government, long before he went to work in the metalforming industry. That advocacy has continued during his time with PMA, having participated in Washington, D.C., fly-ins with the association to lobby on Capitol Hill, and regularly hosting local politicians at his plants, all to voice our industry’s concerns regarding policies addressing healthcare, taxation, regulations and other critical issues. “As an association, we have to become more active,” he stresses, “and I believe it all starts at the local level. Bring congresspeople into your plant, and make the effort to visit D.C. to talk to your representatives. Localization is the key, and I’d like to see PMA encourage, at the District level, our member companies to work with their mayors, state representatives and even their school administrators. This automated cam-bracket assembly cell, which greatly improved productivity at Pentaflex, includes stations for welding, installing and torqueing bolts, and inspecting the completed assembly. Shown are operator Justin Silvers, facilities manager Todd Roderick (right) and vice president of operations Bob Jones. A great place to start is by participating in Manufacturing Day activities and inviting the community—including local politicians—to attend. PMA, which sponsors Manufacturing Day, recently launched, through its Educational Foundation, a new website dedicated to helping manufacturers design Manufacturing Day activities. The site—the Center for Metalforming Careers (www.center4metalformingcareers.org) documents all member activity related to Manufacturing Day, and includes a toolkit that companies can use, including a video that can be shown to visitors explaining the career opportunities available to people working in the metalforming industry.